You may remember, way back in Part Two of this tour, that I mentioned that we would find ourselves north east of Zillebeke Lake later in the year, and as you can see, we most certainly have! Sited next to the road just a handful of yards north of Zillebeke village, Perth Cemetery (China Wall) was begun by French troops in November 1914, and it was not until June 1917 that the first British burials were made here, The Cameronians (Scottish Rifles) becoming the first non-French troops to use the cemetery. Between June and October 1917 some 130 British burials were made in what is now Plot I, but as the tide of war moved east, slowly and bloodily, towards the Passchendaele ridge, the cemetery became redundant. 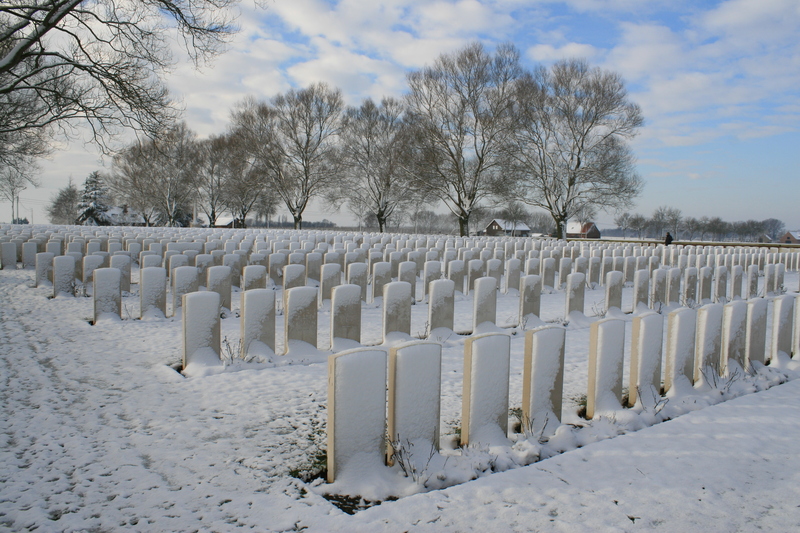 It was only after the war that the number of burials was hugely increased as men, some French but the majority British, were brought here from battlefield graves, and a considerable number of smaller cemeteries, for reinterment. 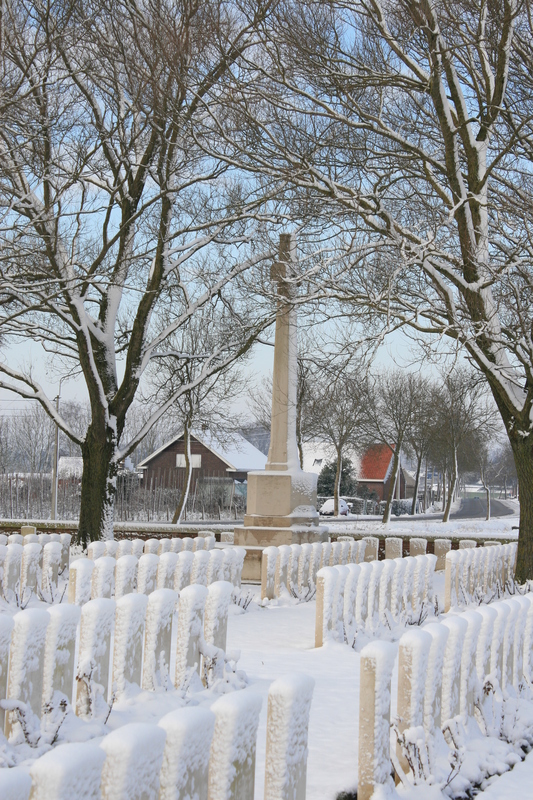 The cemetery is situated a few hundred yards north of Zillebeke itself, and if you were to follow the road a further half a mile north (right) you would find yourself at the roundabout that was once the site of the infamous Hellfire Corner. It’s a curious name for a cemetery, don’t you think? 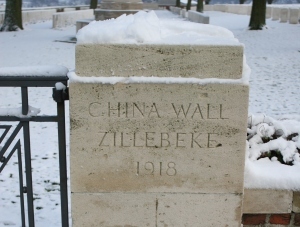 The China Wall part, it seems, derives from the name of a communication trench that ran from near here north to the Menin Road. You have to remember that the term ‘trench’ in much of Flanders was somewhat of a misnomer; the height of the water table precluded the digging of deep Somme-like trenches, so sandbags had to be piled on top of each other above ground to artificially increase the depth of a trench, in turn creating long lines of sandbags stretching across the countryside. This particular trench, one gets the impression, was a fine example, hence it being known as ‘The Great Wall of China’. The Perth part of the name is more difficult to explain. Or possibly not. Most reference sources state that the reason is unknown, or that it possibly had to do with the crest of the City of Perth in Scotland. If you look into the history of The Cameronians (Scottish Rifles), you can trace the regiment back to the amalgamation, in 1881, of the 26th Cameronian Regiment and the 90th (Perthshire Light Infantry). It seems to me that here you have the most likely reason for the naming of this cemetery. Panoramic view of the cemetery from just inside the entrance. The original burials from 1917 can all be found in Plot 1, at the far eastern end, so we shall begin our visit by following the northern boundary wall in that direction. On entering the cemetery the first headstones along the boundary wall in Plot IX, one of the smallest plots, are nearly all men from Scottish regiments killed in late October or early November 1914. 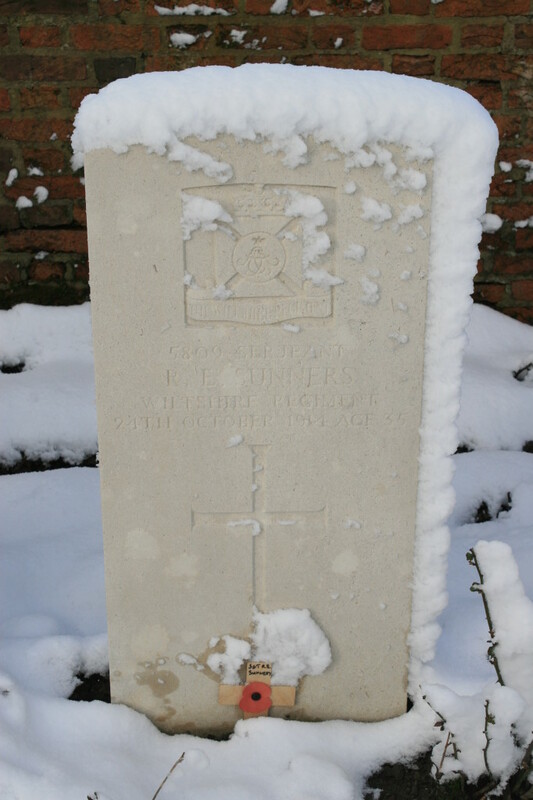 Sergeant R. E. Sunners of the 2nd Bn, Wiltshire Regiment, killed in action on 24th October 1914 aged 35, and now buried here in Plot X. 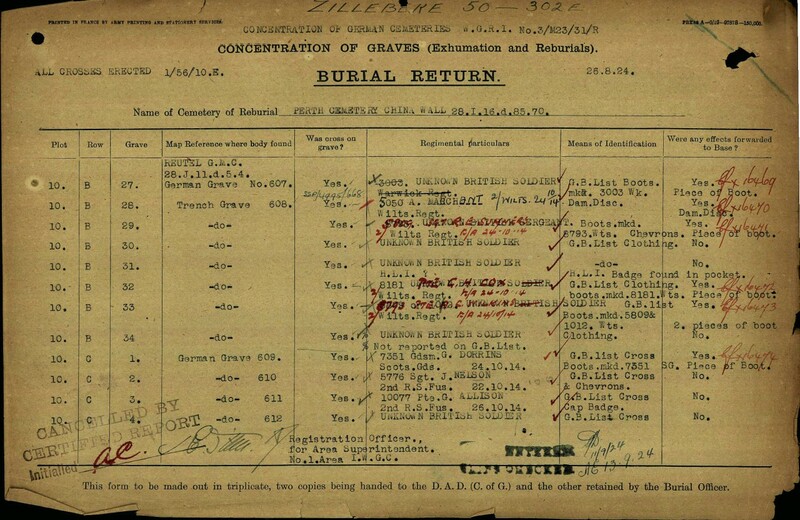 Originally buried in Reutel German Military Cemetery at Becelaere along with more than a hundred other British soldiers, all of whom were reinterred here in the mid-1920s, the documents below (again courtesy of the CWGC) suggest that it was only on exhumation that Sergeant Sunners’ identity was discovered. 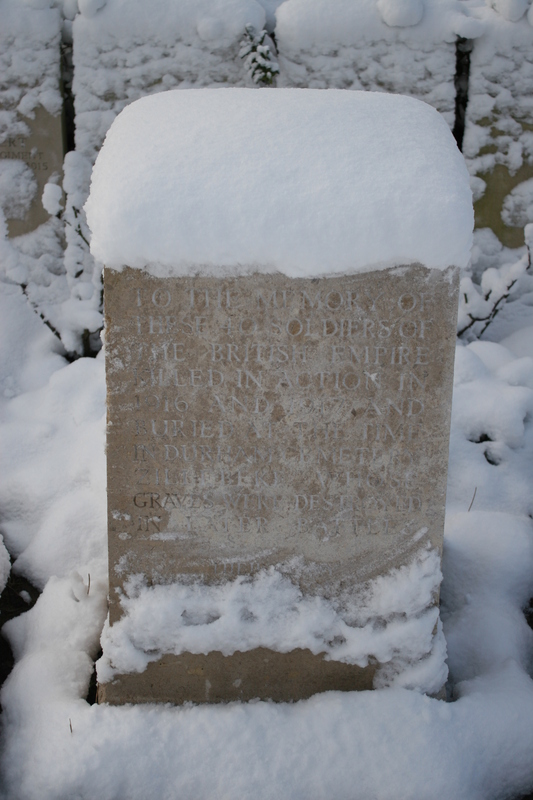 It appears that Sunners was nearly reburied as ‘an unknown Sergeant of the Wiltshire Regiment’. But I can’t explain why, in the document above, a boot marked with his number, 5809, appears elsewhere on the list. …arriving at Plot XIV and the Stone of Remembrance, in the north eastern corner, with the two rows of the smallest plot, Plot XV, in the left background. Plot XV Row A. Three men of the The Queen’s (Royal West Surrey Regiment), and a single South Wales Borderer, all four casualties of late October 1914, are the only identified burials in this row. The two lines of trees in the right background flank the road to Hellfire Corner. The three rows of Plot XVI are mainly burials from 1914 & 1917. 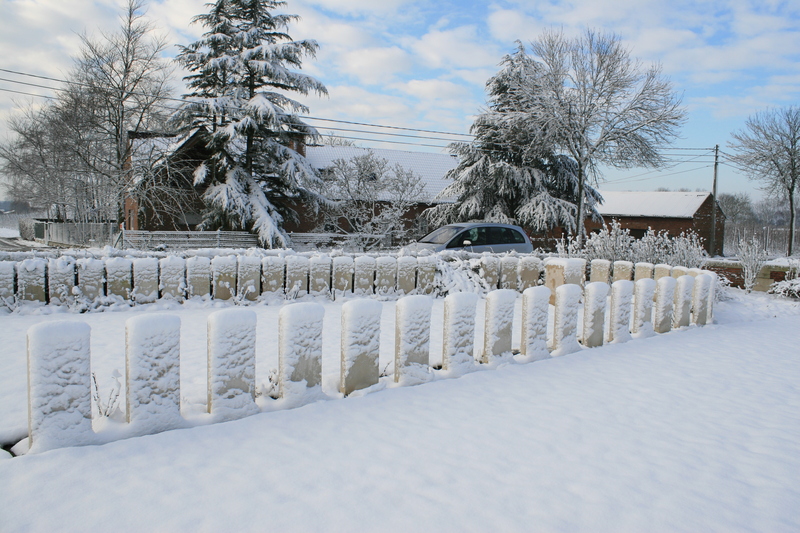 In the background, beneath the eastern boundary wall, special memorial headstones remember 27 men ‘known’ or ‘believed to be buried in this cemetery’. Beyond Plot XVI (front left), the more dispersed headstones are those of the original burials of Plot I. …but it is the scattered nature of the southern part of Plot I that shows us the true nature of the original cemetery. This place was begun as a battlefield cemetery, where the construction of nice straight rows of headstones was understandably of less importance than the safety of men involved in conducting burials under shellfire. Looking north west, the headstones of Plot I in the foreground (those to the far left are the same as those in the previous picture). I suspect that the French burials were originally in this section of the cemetery, and if anyone knows for sure, please let me know, but they have all, including the post-war additions, been long since moved elsewhere, probably to St. Charles de Potyze Cemetery. Looking along the length of Plot I Row D, the Stone of Remembrance in the background, and Row E on our left. The headstones to the far right of the photograph include the earliest of the original Cameronian burials. Twenty six identified men lie in the section of Row D pictured here, most killed in July 1917, but all have the same Grave Reference of Plot I Row D 5, which suggests that although their names are known, the exact identity of each individual body is uncertain. Many more burials were added to Plot I (first five rows above) after the war. 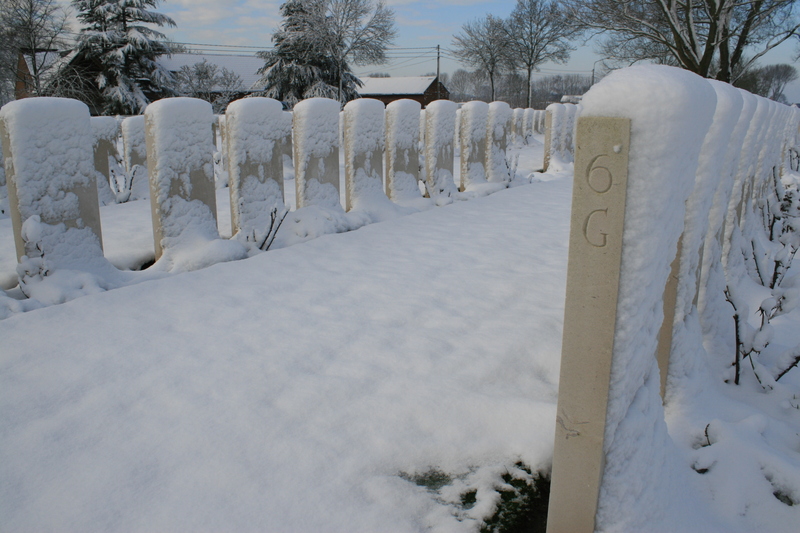 Further along Row G, in the foreground, a man who was executed for desertion lies just a few yards away from another who has the Victoria Cross inscribed on his headstone. 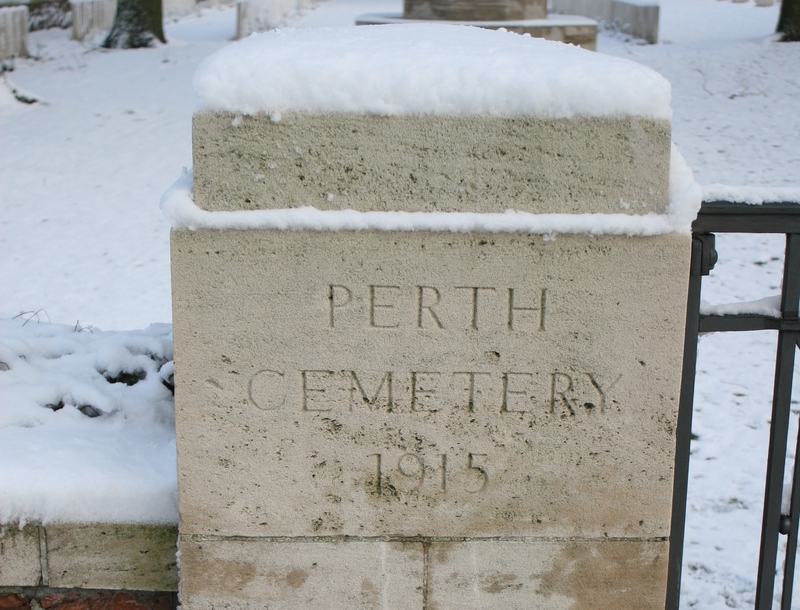 There are now more than 2700 burials at Perth Cemetery, nearly half of whom are unidentified. …and 147 Australians. A substantial number of these are men of the Australian Field Artillery, who suffered heavy losses operating their guns from positions around Zillebeke Lake, only half a mile from here away to the south west. 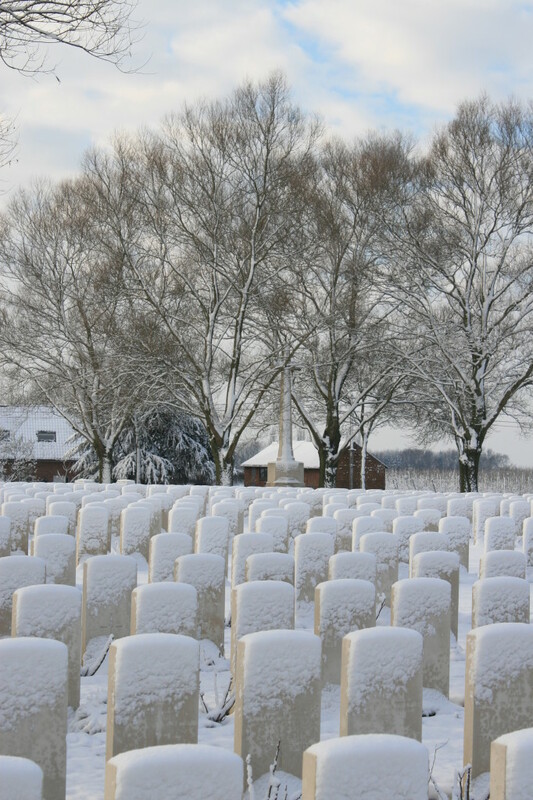 The covering of snow temporarily removes any distinction between each headstone and its neighbours. Beneath the snow, these men become entirely equal. On this day, all are unidentified. Looking across the width of the cemetery along Plot VI Row J. The row continues in the distance as Plot V Row J. Of the forty headstones in the complete row, the identities of 29 are unknown. The first rows of Plot VI (nearest camera) and Plot V beyond. There are seven executed soldiers who lie in this cemetery, all of whom were sentenced to death for desertion. Five of them are buried in Plots V & VI, four in the second row of the photo above. 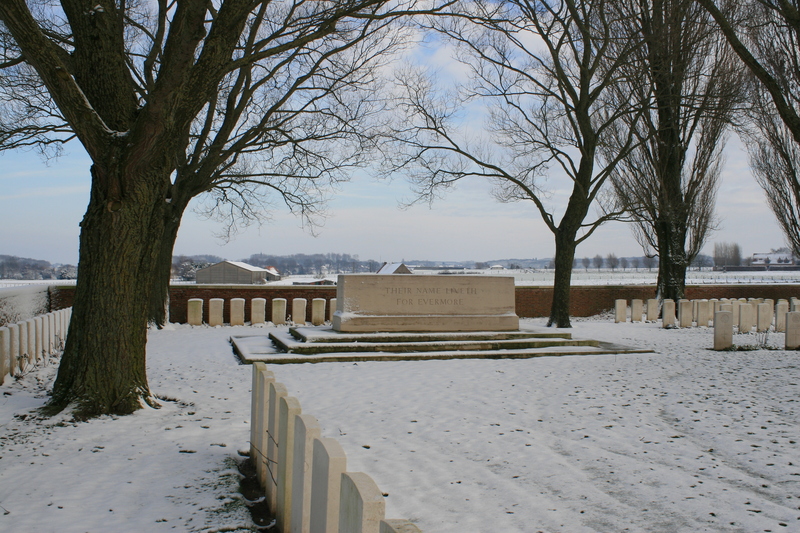 In the left background you can see the headstones of Plot IX, the first men we visited, along the northern boundary wall. The western end of the cemetery, apart from the entrance in the distance, is taken up with 108 special memorial headstones, in the middle of which three Duhallow blocks have been placed, in remembrance of 108 men who were originally buried in a dozen other, smaller, cemeteries, but whose graves were lost in later fighting. 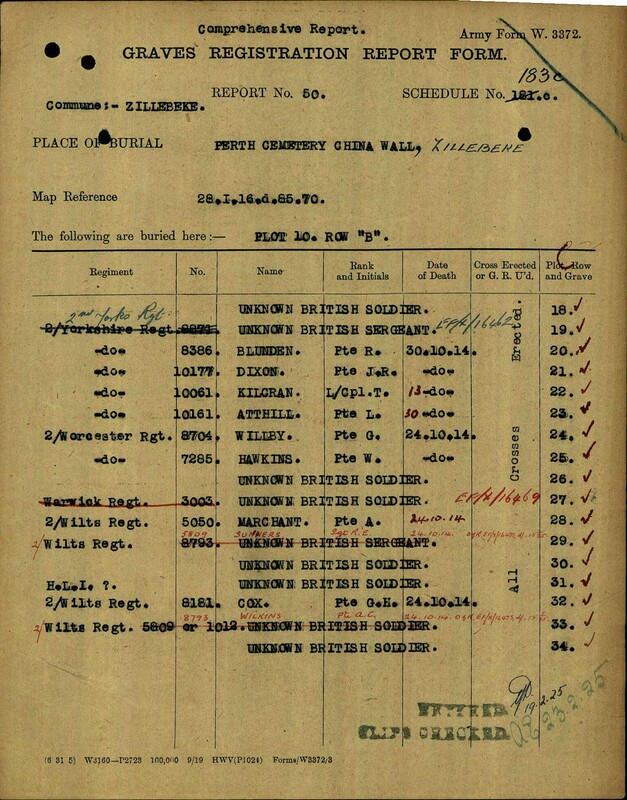 The Duhallow blocks list the cemeteries and number of soldiers whose remains were lost (see following photos). To save you having to work it out, it says 38. Which brings us to the end of our visit. The cemetery was also known by another name during its brief, original, existence. 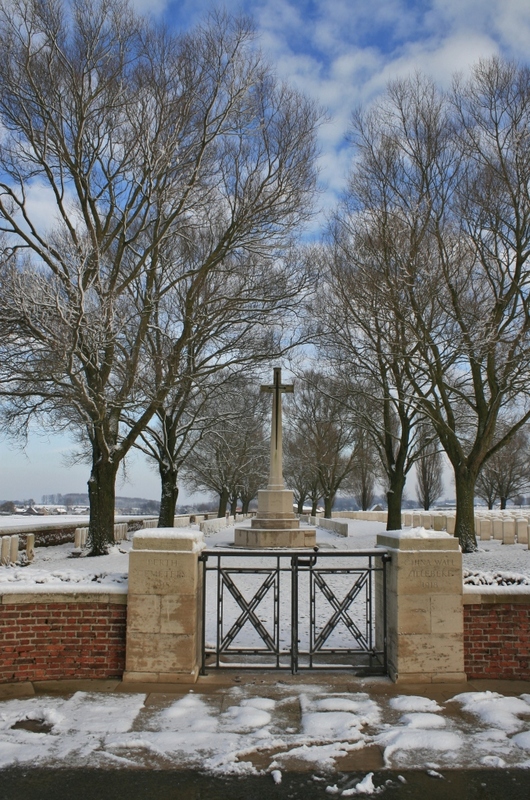 British soldiers referred to it as Halfway House Cemetery, after their name for a farm located not far away to the east. Bearing in mind our earlier ruminations on the cemetery name, I wouldn’t be at all surprised to find that Halfway House was its only name during the war, and that the decision to call it Perth Cemetery (China Wall) was taken post-war. 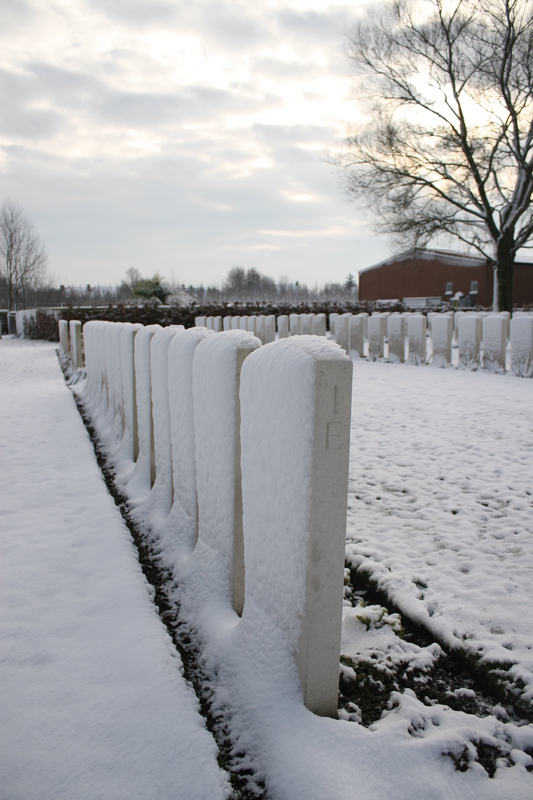 A final look over the cemetery wall at the loop of special memorials. I shall find the time to stop here again one day, perhaps on a warm summer’s afternoon, and visit some of the individual headstones that a covering of snow, however beautiful, makes somewhat difficult to find, let alone photograph. Today, however, we shall head just a short distance down the road into Zillebeke, where Tuileries British Cemetery awaits us. 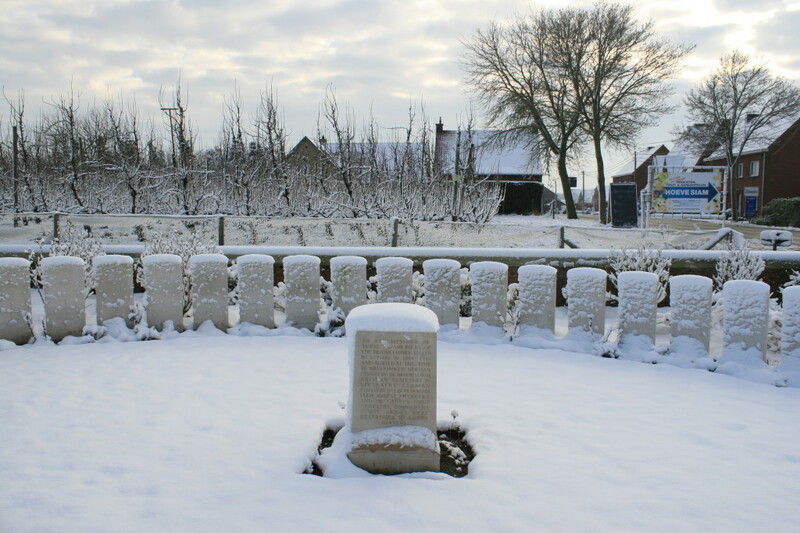 BECELAERE GERMAN CEMETERY No.1 (246th RESERVE INFANTRY REGIMENT), close to Becelaere Church, contained about 500 German and two British burials. 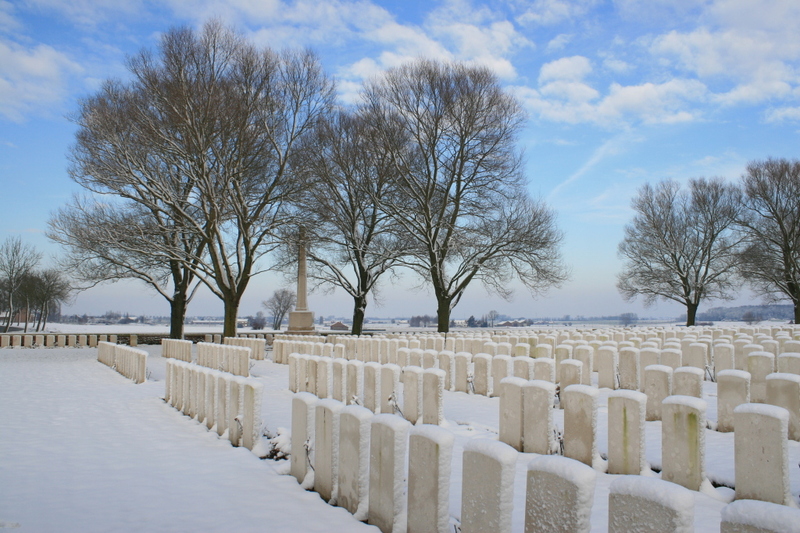 BELGIAN CHATEAU CEMETERY, VLAMERTINGHE, in the grounds of a chateau 2 Kms South-West of Ypres. It contained the graves of 12 soldiers from the United Kingdom, 11 from Canada, and one French soldier, dating from 1914 to 1917. BROODSEINDE GERMAN CEMETERIES, ZONNEBEKE. 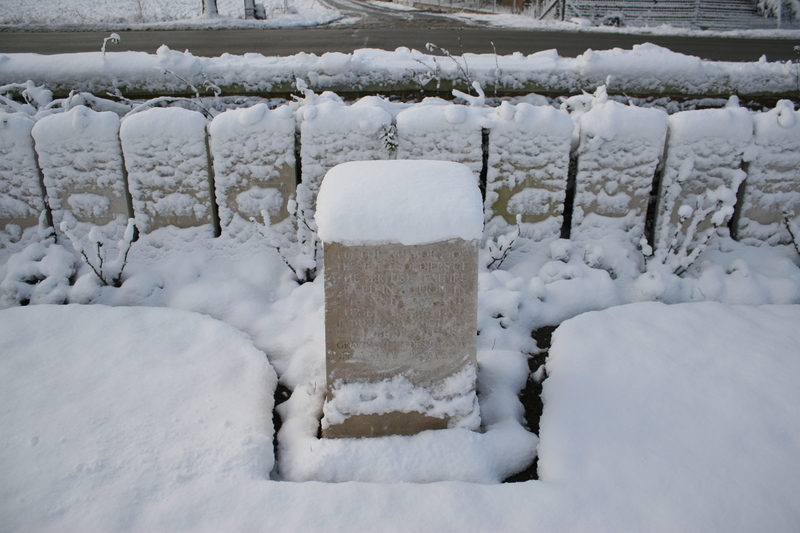 These contained the graves of 27 British soldiers, who fell mainly in 1914. Broodseinde gave its name to the Battle of the 4th October 1917; and the Memorial of the 7th Division, which fought here in 1914 and 1917, is a little South of the hamlet on the road to Becelaere. DURHAM CEMETERY, ZILLEBEKE, at the North end of the village, was used from December 1915 to March 1916. It contained the graves of 52 soldiers from the United Kingdom, 39 of whom belonged to Territorial battalions of the Durham Light Infantry. 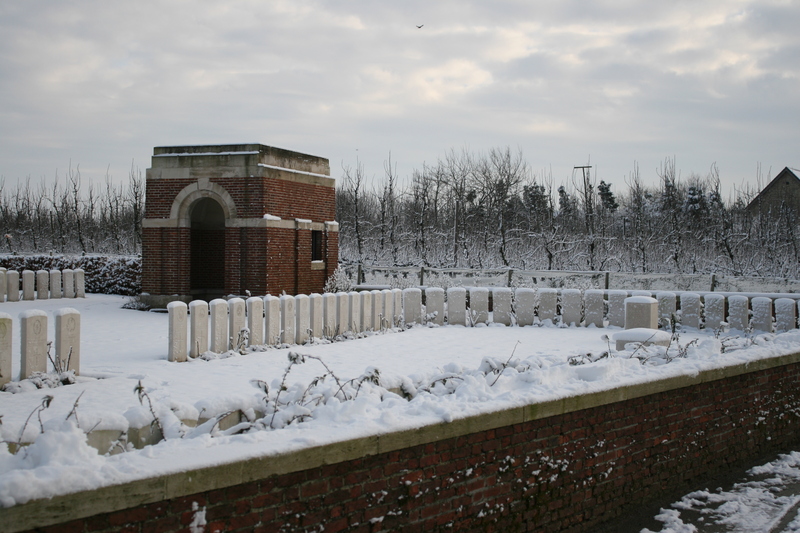 GARTER POINT CEMETERY, ZONNEBEKE, on the road from Zonnebeke to Westhoek, was used from September 1917 to April 1918, and contained the graves of 19 soldiers from Australia, eight from the United Kingdom, one from New Zealand, three of unknown units, and one German. 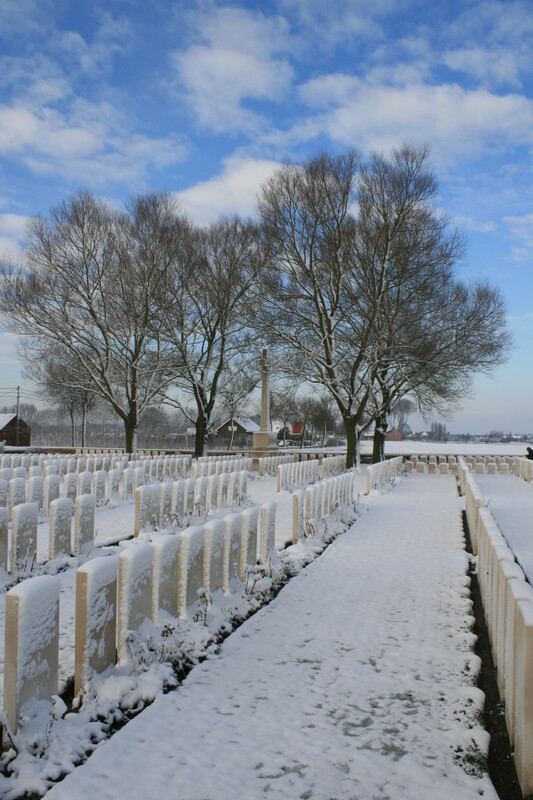 GORDON HOUSE CEMETERY No.2, ZILLEBEKE, at Gordon House, contained the graves of 30 soldiers from the United Kingdom who fell in 1915 and 1917. 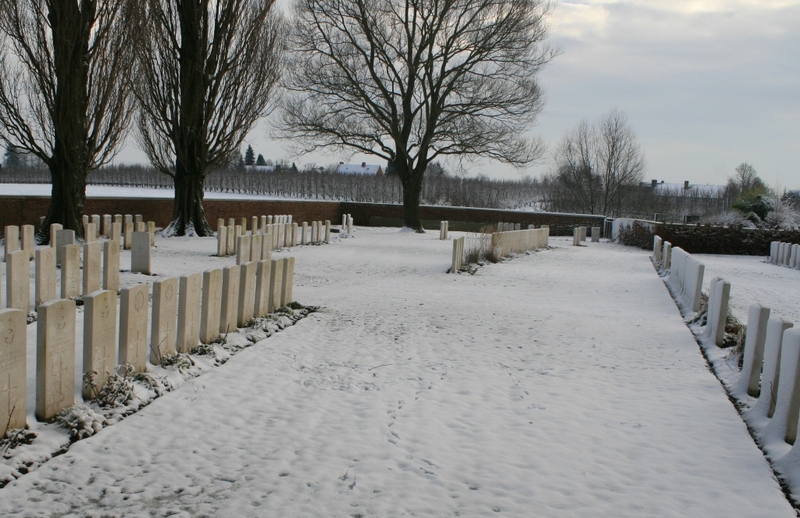 HANS KIRCHNER GERMAN CEMETERY, POELCAPELLE, 1.6 Kms South-East of Poelcapelle village, contained the graves of four soldiers from the United Kingdom who fell in October 1914. 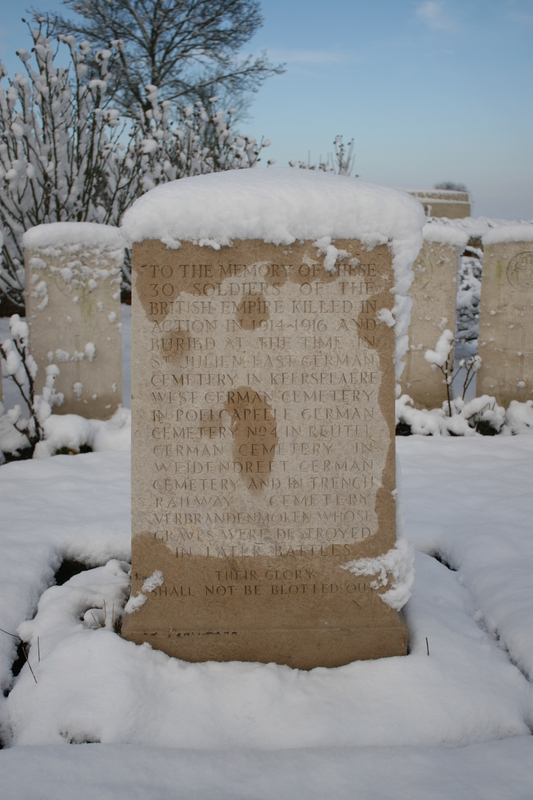 HOUTHULST GERMAN CEMETERY, at the East end of the village, contained the graves of about 1,000 German soldiers and one R.F.C. Officer. KEERSELAERE WEST GERMAN CEMETERY, LANGEMARCK, a little West of the Zonnebeke-Langemarck road, contained the graves of 29 soldiers from the United Kingdom who fell mainly in October 1914. 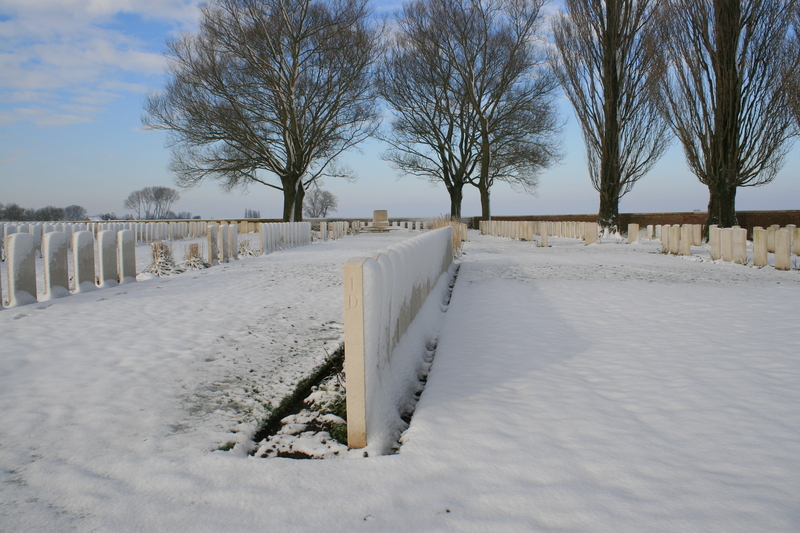 KEERSELAERHOEK GERMAN CEMETERY, PASSCHENDAELE, about 180 metres North-East of Tyne Cot Cemetery, contained the graves of twelve soldiers from the United Kingdom and two from Canada who fell in 1914 and 1915. 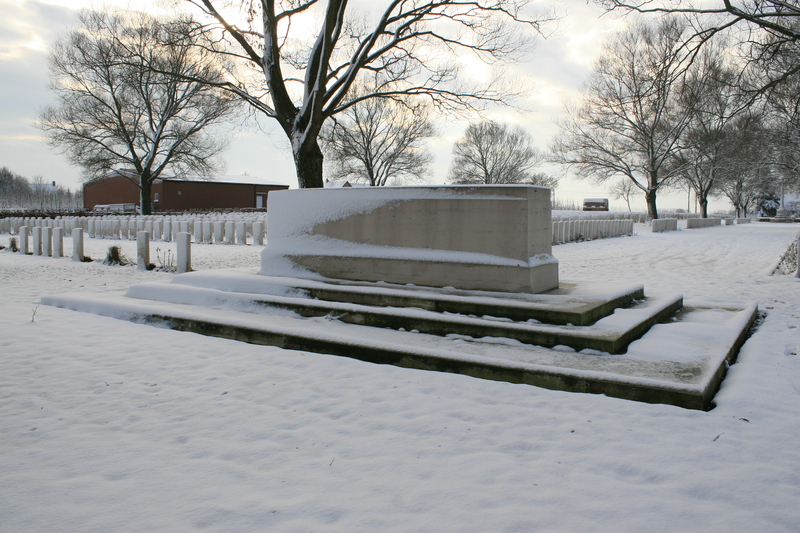 LANGEMARCK GERMAN CEMETERY No.7 (also known as TOTENWALDCHEN), 1.6 Kms North-West of the village, contained the graves of four soldiers from the United Kingdom. 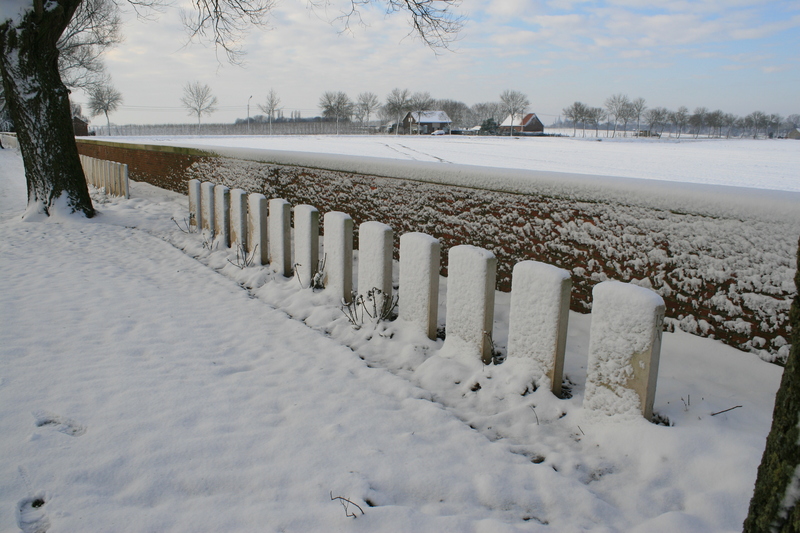 LANGEMARCK GERMAN CEMETERY No.8, just beyond the railway on the road to Houthulst, contained the graves of 27 soldiers from the United Kingdom who fell in October 1914. 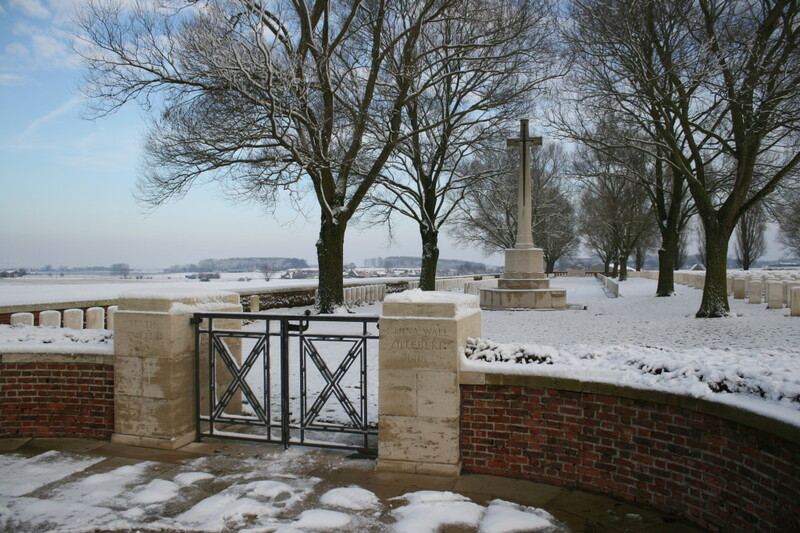 L’EBBE FARM CEMETERY, POPERINGHE, about 1.6 Kms North-West of the town, contained the graves of 21 soldiers from the United Kingdom who fell in 1915 and 1918. 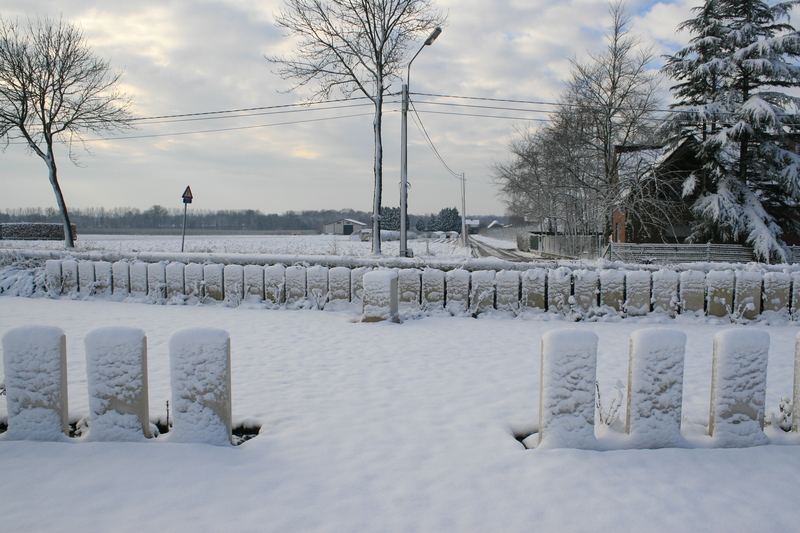 MANNEKEN FARM GERMAN CEMETERY No.3, ZARREN, in the South-East part of Houthulst Forest, contained the graves of about 700 Germans and 13 British soldiers who fell in 1917. MANOR ROAD CEMETERY, ZILLEBEKE, at the railway halt 800 metres South-West of Zillebeke village. 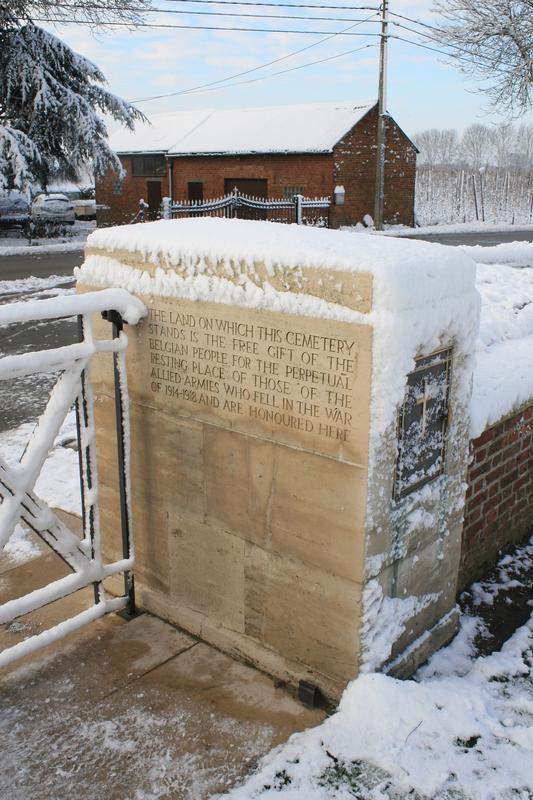 It contained the graves of 17 soldiers of the United Kingdom (mainly Royal Field Artillery) who fell in 1917 and 1918. NACHTIGALL (or ROSSIGNOL, or VIEUX-CHIEN) GERMAN CEMETERY, GHELUVELT, 800 metres North of the Rossignol Cabaret on the Menin Road (near the hamlet of Vieux-Chien), contained the graves of 1,130 German soldiers and 69 from the United Kingdom, most of whom fell in September-October 1915. 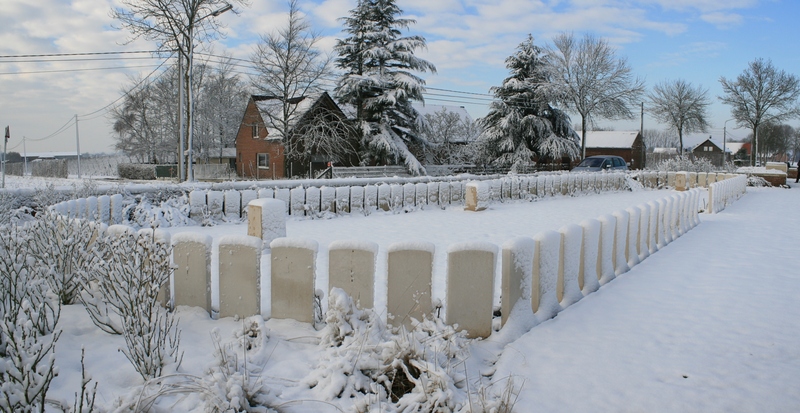 POELCAPELLE GERMAN CEMETERY No.2, about 1.6 Kms South-East of the village, contained the graves of 96 soldiers from the United Kingdom and Canada who fell in 1914 and 1915. POELCAPELLE GERMAN CEMETERY No.3, 800 metres South of the village, contained the graves of 23 soldiers from the United Kingdom and 19 from Canada who fell in 1914 and 1915. RATION DUMP BURIAL GROUND, ZILLEBEKE, on the road a little South of Gordon House, contained the graves of 28 soldiers from the United Kingdom (mainly London Scottish and Liverpool Scottish) and one from Canada. 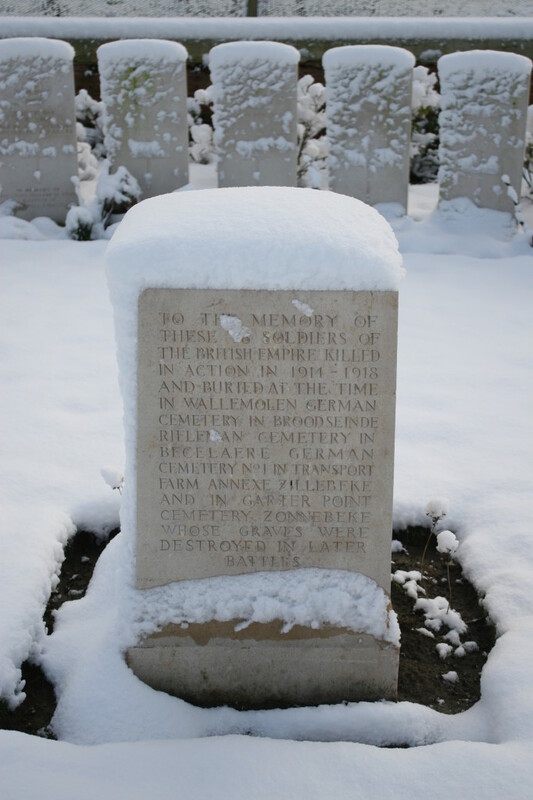 REUTEL GERMAN CEMETERY, BECELAERE, on the North side of the Reutel-Zwaanhoek road, contained a very large number of German graves and 125 soldiers and airmen from the United Kingdom, two Canadian soldiers and one from New Zealand, who fell in 1914-1917. 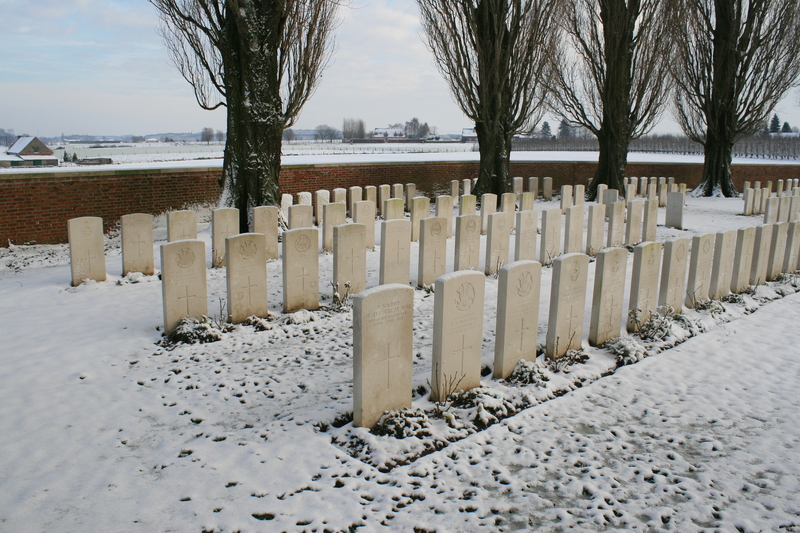 ST. JOSEPH GERMAN CEMETERY, HOOGHLEDE, on the North side of the hamlet of Geite or St. Joseph, contained the graves of four airmen from the United Kingdom who fell in 1918. ST. JULIEN COMMUNAL CEMETERY, LANGEMARCK, contained the graves of six soldiers of the 14th Canadian Battalion who fell in April 1915. ST. JULIEN EAST GERMAN CEMETERY, LANGEMARCK, on the Langemarck-Zonnebeke road, contained the graves of 65 soldiers from the United Kingdom and 31 from Canada who fell in October 1914 and April 1915. SCHREIBOOM GERMAN CEMETERY, 800 metres East of Langemarck village, contained the graves of 34 soldiers from the United Kingdom who fell in October 1914. 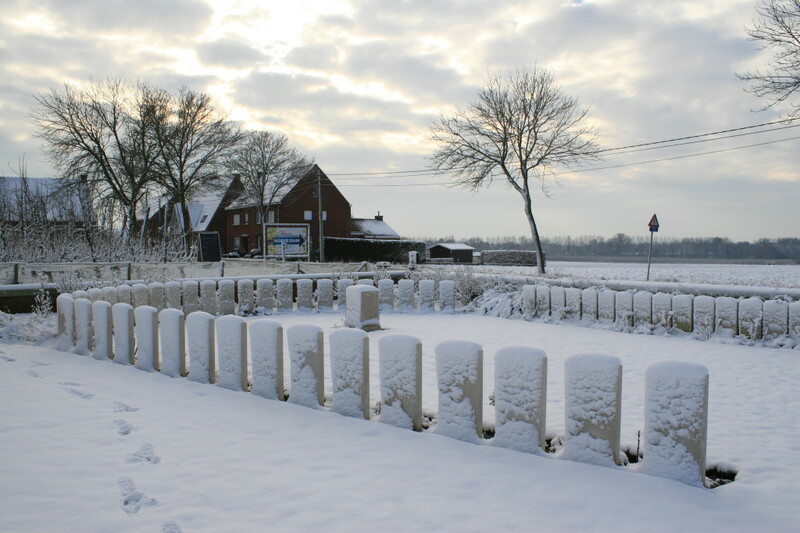 TRANSPORT FARM ANNEXE, ZILLEBEKE, 180 metres South of the South-West corner of Zillebeke Lake, and a little East of Railway Dugouts Burial Ground (Transport Farm), contained the graves of 27 soldiers from the United Kingdom (16 of whom belonged to the 1st Dorsets) who fell in November 1914-June 1915. 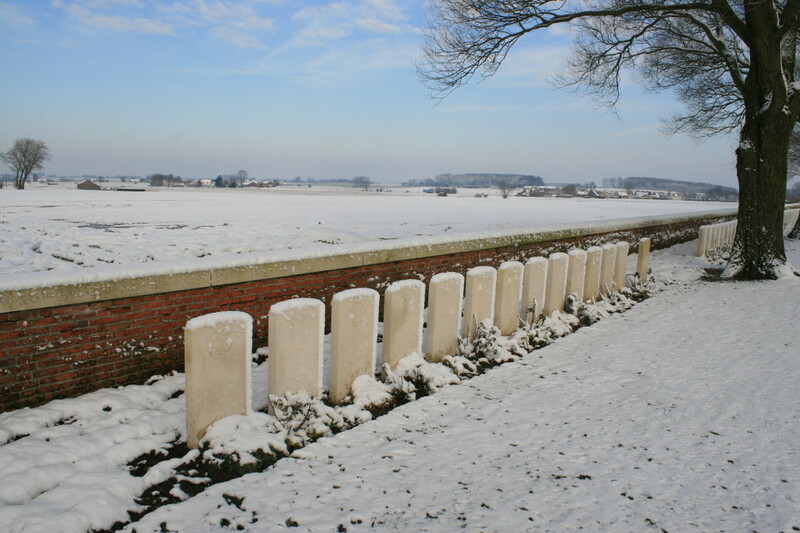 TRENCH RAILWAY CEMETERY, ZILLEBEKE, on the West side of the hamlet of Verbrandenmolen, contained the graves of 21 soldiers from the United Kingdom who fell in 1915 and 1916. 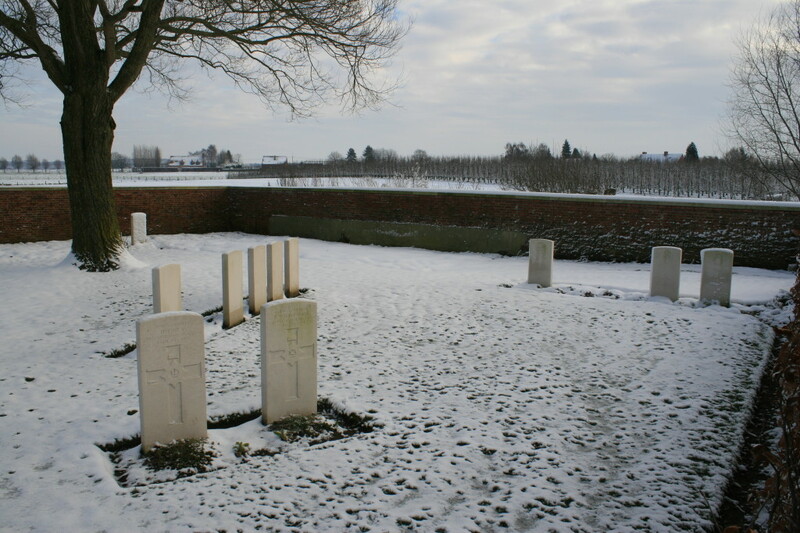 TREURNIET GERMAN CEMETERY, POELCAPELLE, on the road from Poelcapelle village to the railway station, contained the grave of one Canadian soldier. 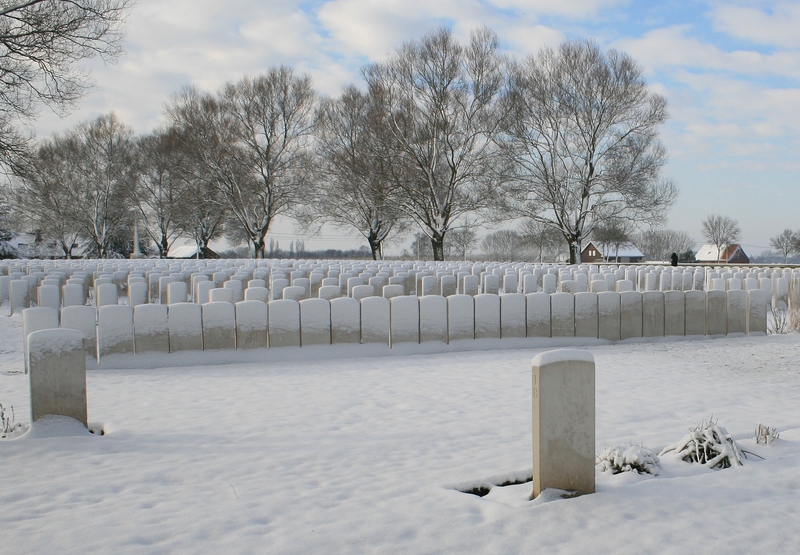 WALLEMOLEN GERMAN CEMETERY, PASSCHENDAELE, 180 metres South of the hamlet of Wallemolen, contained the graves of 20 soldiers from the United Kingdom and 15 from Canada who fell in 1915. WEIDENDREFT GERMAN CEMETERY, LANGEMARCK, at Weidendreft Farm, used by the Germans from October 1914 to August 1915, contained the graves of 98 soldiers from the United Kingdom who fell in the Battles of Ypres, 1914. 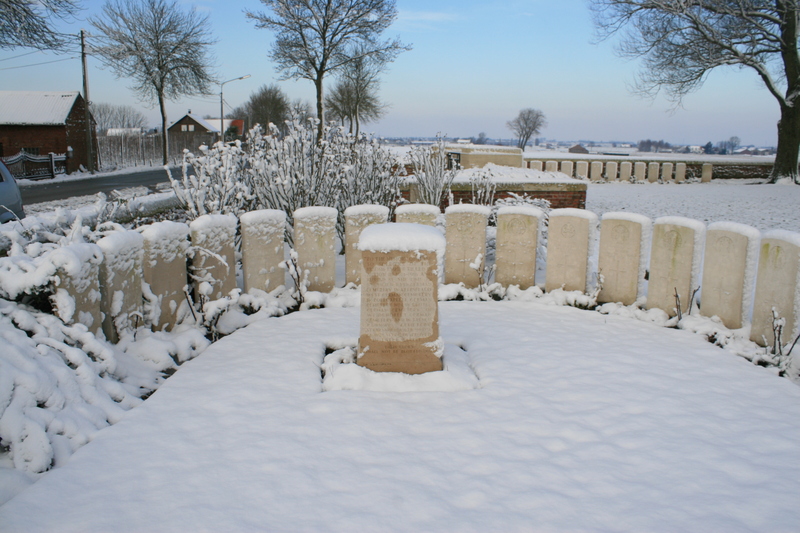 WESTROOSEBEKE GERMAN CEMETERY No.2, 366 metres North-East of the village on the road to Hooghlede, contained the grave of one R.A.F. Officer who fell in August 1918. Knowing some of your background and having followed many of your posts I should not be again amazed at your incredibly wonderful photography, captions, descriptions and research – but MJS I am! Interesting to read the background for naming Perth Cemetery. The Perth I live in was named in 1829 after Perth Scotland by my (then) Captain James Stirling our Founder and first Governor. There’s more to that story of course. As you know, I live in Scarborough which is in the local government City of Stirling. I had a phone call from Guildford two days ago alerting me to St John’s Stoke planning to sell off more of their cemetery to help fund a building project – apparently the section in which lies the remains of my interest which you know about – there goes another part of the connection to Admiral Sir James and wife Ellen Stirling. Sid, it hadn’t occurred to me that you live in Perth!! Ha! Thanks again for some wonderful comments. Honestly, it is so appreciated. I was unaware of the potential St. John’s land sale. I shall keep an eye on it. Church authorities turned somewhat secretive over the last three years. A loooong story that includes their reneging on clear verbal undertakings made at an on-site meeting. My suspicions have now proven well founded. I now have a copy of their 7 November 2014 Press Release. Please let me know if you’d like me to send to your email address. It seems the entire Extension Cemetery is to be sold. There’s a Public Exhibition meeting on 20 November. I’ve emailed the Press Release nominated email asking questions and will look forward to the answers! Will keep you posted on that aspect. Needless to say, I’m highly concerned the Western Australian founded and focused memorial will end up but another “Forgotten Grave” memory. Yes, Sid, please do send me the press release, and yes, keep me posted. Another post is on its way in the next hour or so, and as you will see, it isn’t the easiest place to write about. Sometimes one finds websites that relate our own feelings and emotions . . . Thank you for the hours spent putting together your information and photographs. This year we visited the Somme (four nights) and an albeit brief (one night) visit to Ypres with my 88-year-old father, revisiting Tyne Cot, Hill 60 and China Wall. 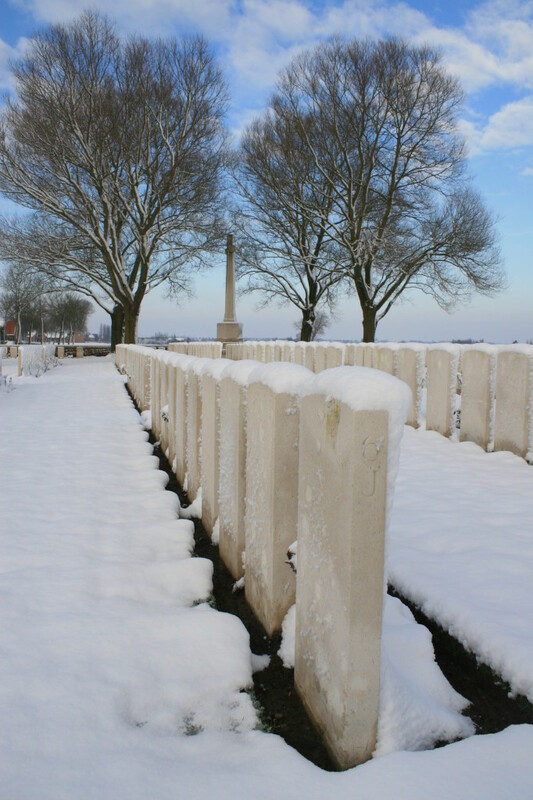 Next year (June 2015) we will be embarking on our fourth visit to the WW1 areas of Ypres (Belgium) and Albert (Somme, France areas). Our June 2015 visit will be 100 years since my wife’s great-great-uncle (A. T. Toogood, 1st Dorsets) lost his life on June 12, 1915 and he is one of the 16 Dorsets in the plot to the right of the cemetery’s entrance. Arthur Thomas originated from Shaftesbury, Dorset. Again, many, many thanks for your commitment. Mike. You are too kind, Mike. Glad you found my site, glad you are enjoying it, and thanks ever so for your comments. It really is appreciated. If you are interested, click on the ‘notify me of new posts’ box below to get a heads up each time a new post is uploaded. My great grandfather Pte Robert Oldfield 24722 Manchester regiment, 19th battalion is laid to rest here. It will be 100 years this coming June 22nd 2017 when he was killed in action. I am going there to try to retrace his footsteps a little. I know he was in the battle for the Messines ridge, but after that and before the third battle of Ypres had begun, I believe he may have died somewhere near Chateau Segard and the trenches in the Ypres salient. Enemy artillery and aircraft were quite lively during this time and the Battalion suffered a few casualties on the 22nd. I am still researching though, so not absolutely sure of all the info just yet. Good stuff Jamie. The Battle of Messines ended on 14th June and your Great Grandfather died a week later. You may be interested that I am currently writing a post that will include a lot about the evacuation of the wounded during and after the battle – unfortunately it is about the southern part of the attack (I am guessing that your Great Grandfather died further north), but you might find it of interest. I think there will be two other posts before it is published. And of course there is a complete tour of the Messines Ridge elsewhere on this site (use the search box). Thank you magic fingers. His regiment was the 4th city 19th battalion, I forgot to add this previously. A Belgian historian who I will be meeting there when I go, has told me that my greatgrandfather was buried where he fell at the time in a place that was named Durham cemetery, but that this area was totally destroyed in shelling later and so his headstone in Perth cemetery is only that and that his body will not be there, hence the reason I want to get as much info as I possibly can as to the close proximity of the spot he died. Thanks for your reply to me. I am grateful to you. You are most welcome. 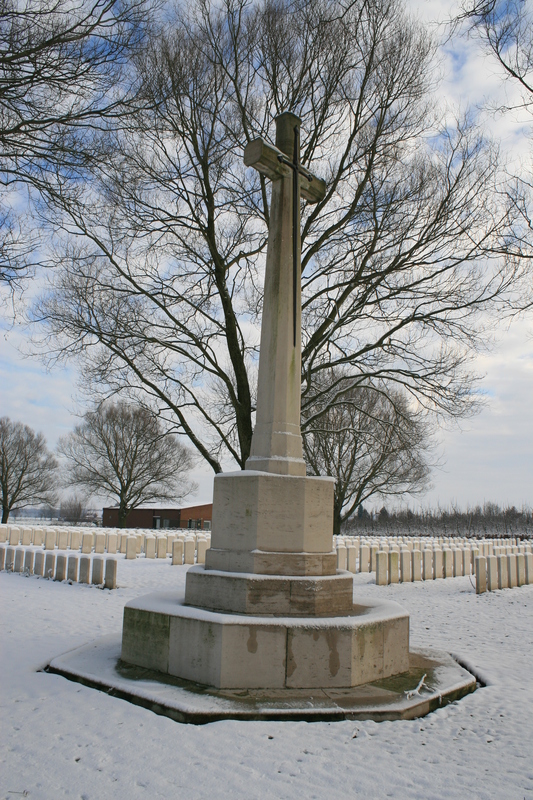 “DURHAM CEMETERY, ZILLEBEKE, at the North end of the village, was used from December 1915 to March 1916. It contained the graves of 52 soldiers from the United Kingdom, 39 of whom belonged to Territorial battalions of the Durham Light Infantry.” I cannot believe that it isn’t possible to pinpoint where the cemetery was. Someone at the Great War Forum would do it for you. Also you will see that Durham Cemetery in inscribed on one of the Duhallow Blocks I photographed for the above post – your Great Grandfather’s headstone (Memorial No. 70) is one of those roughly behind the block. So we start with a most welcome, and end with a welcome: Welcome aboard Jamie. Check out the other Zillebeke posts before you go – and by the way, I am always likely to update old posts with new information or new photos – it’s a living breathing blog!! Sort of. Hope you enjoy it. Thanks I will keep in touch now and post any photos I take when I get there. I especially want to go to the Menin gate to hear the last post played. Thank you very much, I am grateful to you. Well hello Les. And many many thanks for your kind words. Oh, the cemeteries are still looked after beautifully – more so than ever, with the huge interest these days. What I will guarantee you is that some time, quite possibly next year, I intend to revisit the two cemeteries (Perth & Tuileries) on Maaldestedestraat in weather other than snowy, so do come back and have a look at some point; or sign up for all my Great War posts, if you’re interested, by ticking the second of the two boxes below. Thanks again for commenting.